Black Orange Black Combi Rubber (Blk/Or/Blk) conveyor belt Scraper rubber provides excellent cleaning power against granulated, sticky and washed material. Constructed of excellent quality natural and synthetic rubber. Blk/Or/Blk is made of an inner layer of flexible rubber sandwiched between 2 layers of higher durometer rubber. 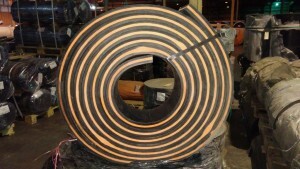 This provides the belt with excellent rigidity and excellent wear life. 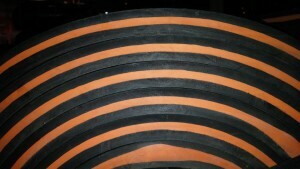 These are available in widths of 6″ to 60″ contact us for more information.